The Fortune Delight Business Pack is your key to discounts on Sunrider Products! For only $100, you get $75 worth of Fortune Delight, plus more. With the discounts this Pack opens up for you, it will pay for itself the very first time you order! 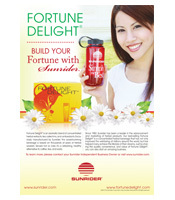 The Fortune Delight® Business Pack contains one of Sunrider’s best-selling products and marketing tools. Fortune Delight® is an aromatic blend of herbal extracts, tea catechins and concentrated antioxidants that assist the body natural cleansing process. Delicious hot or cold, it is easy to share with others and a healthy alternative to coffee, tea and soda. The Marketing Tools include professionally designed brochures and training from your sponsor to help you succeed as a Sunrider Independent Business Owner (IBO). Everything is provided to learn more about Sunrider, promote the products, and teach others. With this additional support and knowledge, you can more easily reach your Sunrider goals! Be the first to review “Fortune Delight Business Pack” Click here to cancel reply.